On a grinding machine, balls for ball-bearings are ground. After the grinding process, the balls are to be measured directly on site and evaluated. Possible correction values for the production process are to be transferred directly to the PLC which controls the grinding machine. For this purpose a very robust measurement technology is required as the measurement is effected on the production site. The application controls whether the dimensions of the balls lie within predefined parameters or not. If not, the PLC is to initiate the necessary corrections. 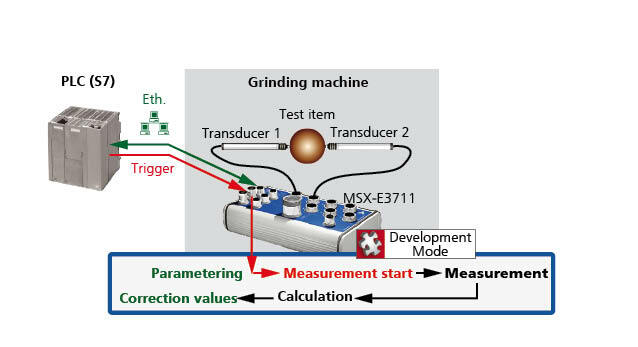 For this task the robust MSX-E3701 system is used with a development mode application, in which two sensors acquire and measure the balls. The measured values are calculated and compared to the predefined parameters of the PLC. With this predefined values it is possible to check if the balls have the correct size or if it is necessary to regrind them. The result of the calculation and the measured values are transferred to the PLC which controls the grinding machine. The PLC can then ­readjust the grinding process. The capacity to calculate values onboard relieves the PLC, accelerates production cycles and achieves significant improvements in quality.